Within three years, that serene and stirring spot had been visited by some 16 million people, for it had become, by a terrible stroke of violence, the eternal resting place of the slain Kennedy. As more time passed, and more visitors climbed the tree-shaded hill to the site, more graves were added in what is known as Section 45 of the rolling Arlington acreage  including graves for Robert Kennedy, and later Jacqueline Kennedy Onassis. 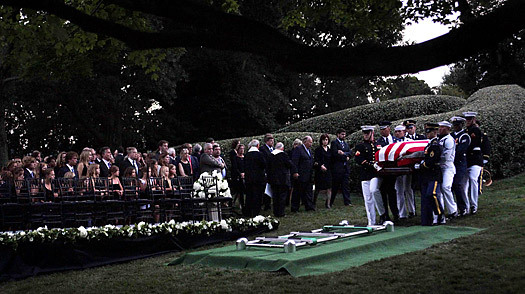 Edward Kennedy was buried Saturday on that spot and in that company. It was a hot, thick evening at the end of four long days of remembrance, summation and the grieving of friends, family and admirers. The hearse passed thousands of citizens who waited without wilting to pay their respects. Fading sunlight was softened by a few welcome clouds at the end of a blazing day. Night was falling. Cicadas chirped and thrummed. The faintest of breezes caught in the crowns of two maples flanking the opened ground. After the laughter and singing, the mixed smiles and tears of the Friday wake; after the heartbreaking hymns and ancient prayers of the Saturday morning funeral; after so many words and pictures, the burial was brief and quiet. The Archbishop Emeritus of Washington, Cardinal Theodore McCarrick, conducted the Rite of Committal and Prayer of Commendation, reading from a letter that Kennedy asked President Barack Obama to hand-deliver to the Pope earlier this summer. The senator asked for the Pope’s prayers, because he knew his brain cancer had the upper hand. “I know that I have been an imperfect human being,” Kennedy wrote, “but with the help of my faith I have tried to right my path.” The Vatican’s letter in response, made public by the Cardinal for the first time, encouraged Kennedy to remember that suffering can have its own spiritual force. The senator’s wife, Victoria, was the picture of dignity walking along the sloped ground with her hand on her son’s arm; on her face she wore a look of utter and exhausted sadness. She had given a 100-hour tutorial on composure and grace, On the way to Arlington, the hearse paused outside the Senate chamber where Kennedy served longer than all but two men in the nation’s history. Victoria Reggie Kennedy stepped from the motorcade and a great cheer went up. She hugged current and former members of her husband’s staff, waved softly, blew gentle kisses. Kennedy’s children, stepchildren, grandchildren, nieces and nephews smiled stoically, and some of them shook hands, as they had done for days. By the end of the last service  as two grandchildren paid sweet, informal tribute  a wind was rising, and lightning flashed in the distance. It is a solemn matter to carry a casket to the earth. Solemn indeed to hear Taps played in darkness broken by a dancing eternal flame. But this was Arlington, where some two dozen burials take place each day. Solemnity hangs over those hills like the atmosphere. Some of those many funerals are for white-haired old warriors, but not in Section 60, where the honored dead of the wars in Iraq and Afghanistan are marked in spreading ranks of white headstones. Those graves will never be visited by throngs of millions. But they and the countless thousands of others belonging to the lost of the nation’s wars hallow the place more by their near-anonymity than do the graves of Sherman, Pershing, Marshall, the Kennedys or any of the other history-book names on Arlington headstones. It is indeed a beautiful place to stay forever, because of neighbors like them.